WEST CHESTER, PA _ The Chester County Commissioners presented a check for $50,000 to representatives from Uptown! Entertainment Alliance this week. 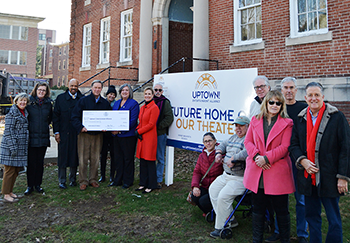 The funds are part of the County’s annual appropriations to organizations and non-profits, and the check was presented in anticipation of the New Year’s Eve opening celebration of the Uptown! Knauer Performing Arts Center. The County’s contribution comes at a critical time in the efforts of Uptown! Entertainment Alliance to raise the last $1 million needed to complete the performing arts venue. In total, $3.9 million was identified to purchase, re-purpose and preserve the West Chester National Guard Armory building, converting it into a non-profit theater for film, live performance and workshops that will serve the greater West Chester community. One of the County Commissioners’ strategic priorities is to optimize the quality of life in the community, and particularly to invest in the County’s urban centers. “Our goal of bringing a theater to West Chester was to create a cultural hub within walking distance to West Chester’s revitalized restaurant and shopping district. We envision people who live and work downtown walking over for a film or concert, young people enjoying music in a theater setting, students taking performing arts classes and seniors from nearby retirement communities enjoying matinee performances,” said Angela Scully, Executive Director of Uptown! Entertainment Alliance. Pictured: Uptown! Board member Marilyn Parsons; Uptown! Executive Director Angela Scully; Chester County Commissioners’ Chair Terence Farrell; Tom McEvoy, Board President; Nicole Scimone, Uptown! Launch Director; County Commissioners Kathi Cozzone and Michelle Kichline; A. Roy Smith, Board member, Holly Brown, Board Vice President; Jimmy Jeffers, Board member; Gary Green, Board Secretary; and Lynn Alfonsi, Kane Bender and Chris Lang, Board members.